The fox was believed to have been hanging by its back leg for at least 12 hours before being set free by the rescue team. Trevor Weeks MBE, founder of East Sussex WRAS, said “The caller did exactly the right thing in leaving the fox caught. The charity says it has dealt with over 25 cases of wild animals and birds being caught or entangled in everything from stock fencing to football goal netting over the past month. On several occasions people have managed to cut the casualties free only for the injured animal to struggle off injured. WRAS advise that if you find a casualty which is caught or entangled, back off call a rescue organisation as soon as possible. East Sussex WRAS was established as a voluntary group in 1996, but some of its rescuers have been rescuing since 1985. The organisation was set up in order to provide a front-line rescue service for wildlife casualties who unlike their domesticated cousins, do not have owners to help look after them. WRAS deals with calls from members of the public and other animal welfare organisations like the Swan Sanctuary, Fox Project, Southdowns Badger Group, International Animal Rescue, British Divers Marine Life Rescue, Sussex Bat Hospital and many others. 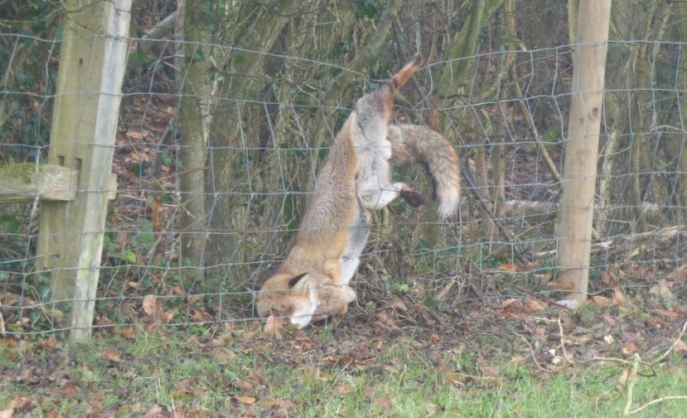 Responses to "Wildlife Team Rescues Fox With Its Foot Stuck In A Fence"